She doesn’t wonder any-more. Neither does anyone else. The 21-year-old will head home to Houston with gold medals from the team final, the all-around final, floor and vault as well as silver on uneven bars and bronze on beam. She be-came the first woman to earn a medal on all four events since Yelena Shushunova did it for the Soviet Union in 1987. 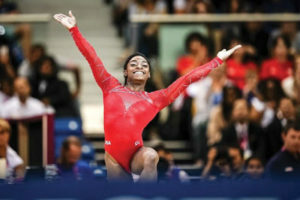 Biles believes it’s just the beginning. She’ll visit with doc-tors to treat the kidney stone, go on a short vacation and then point toward 2019.